A member of the public contacted the Department of Primary Industry and Resources (DPIR) response team through the Citrus Canker Hotline and the on-line reporting option to report the suspected citrus canker infected plants on their property in the Howard Springs area. An additional restricted area, including movement restrictions for citrus and host plant varieties and their associated material in the area around the detection, has been put in place. The Howard Springs restricted area is within the established greater Darwin Control Area gazetted on 21 May 2018. The two infected potted citrus plants on the property were purchased from a known supplier within the past six to eight months. An adjacent mature planted citrus tree was not displaying signs of citrus canker. There are 44 residences in the new restricted area in Howard Springs and surveillance officers from the emergency response team will conduct property owners, and arrange inspections to ensure there has been no spread of the disease. 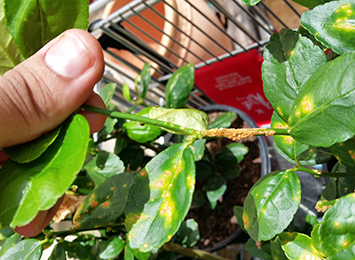 This most recent citrus canker detection is the ninth confirmed infected premise in the Northern Territory. All discovered infected plants to date are potted plants sold within the past 12 months and directly linked to one supplier, a positive indicator there has been no natural spread of the disease. There has still been no detection of citrus canker on any commercial citrus growing properties in the Northern Territory. Northern Territory Farmers Association continues to work closely with the Northern Territory Government to keep growers informed of events as they occur. For more information visit the citrus canker webpage.